Some groups have spoken out against the change, saying a respected medical body's reputation has been damaged. Others called the decision "absurd". However, a group of doctors opposed to any change in the college's position are planning to challenge the decision to ask for a majority result. 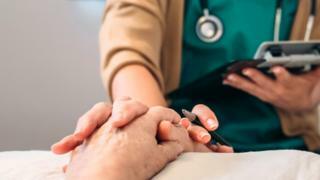 Royal College of Physicians (RCP) president Prof Andrew Goddard said: "It is clear that there is a range of views on assisted dying in medicine, just as there is in society. "Neutral means the RCP neither supports nor opposes a change in the law and we won't be focusing on assisted dying in our work. Dr Gordon Macdonald, chief executive of Care Not Killing, said most doctors didn't want a change in the law on assisted suicide or euthanasia. "We hope that the RCP will listen to this message from their members and reverse their absurd decision to adopt a position that is the least popular and commands the support of just one in four of doctors," he said. "This is why our view is clear, society should be doing everything in our power to prevent suicide, not assist it." Campaign group Living and Dying Well said the shift had damaged the college's reputation as a professional body. Of palliative medicine doctors, 80% voted to maintain the college's opposition to assisted dying. The BMA, the doctors' trade union, is opposed to assisted dying. Motions calling for it to adopt a neutral position have been repeatedly rejected. Dr John Chisholm, BMA medical ethics committee chair, said: "Our focus remains on improving the standard of palliative care available for patients, through calling for greater investment and support to enable staff to deliver the highest quality end-of-life care."